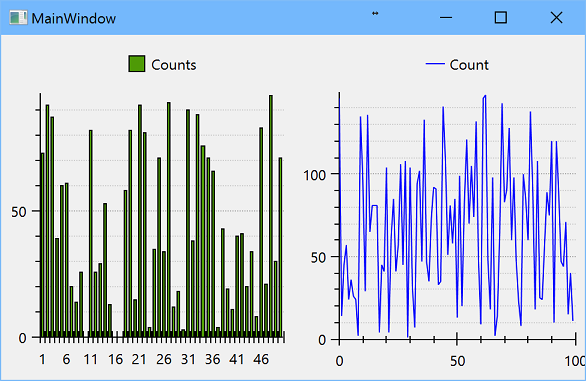 This article is devoted to the Wpf application that shows (emulated) real-time data in charts. It could be used as base for monitoring application, when data service provide real data like, for example, number of http requests or CPU temperature. OxyPlot library is used for chart controls, as it is lightweight and easy to use. Solution contains one Wpf application project. The main part of the application is chart repository - the object that receives data from services, parses and provides it to consumers. Data service emulates data, but in real-world example it reads data from external source, and put it to repository. Data service is controlled by application, and there are several instances could be executed. User controls consume data from repository and update charts. Properties are used by consumers, that in this application are view models for user controls. LineCountListprovides one-dimensional series as values for some process. Repository keeps not great than 100 values. Data services use AddLineCount to add new value. ColumnCountList provides two-dimensional data like the set of pairs (index, value), and could be used as distribution of process values. Data services use AddColumnCount to add pair (index, new value).